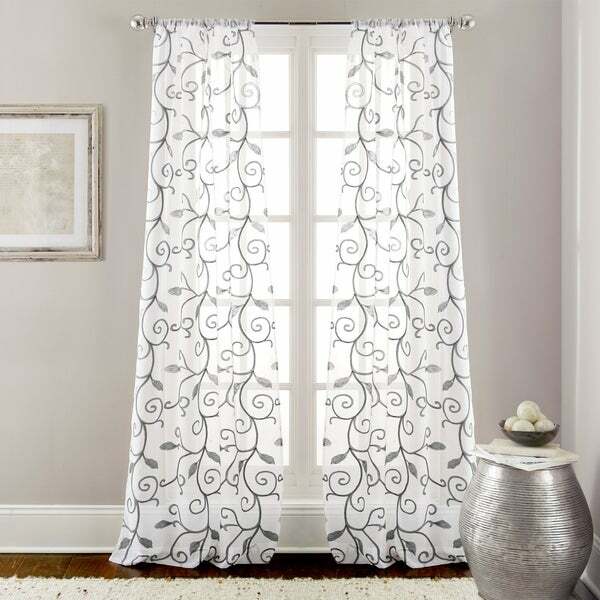 Add delicate sophistication to your favorite room with this lovely curtain panel pair. Each ethereal panel features a white, sheer background that will softly diffuse the light and brightening your space. The machine washable panels are embroidered with a leaf swirl design, available in your choice of white, grey, ivory, or taupe to create a subtle accent that will lend timeless elegance to your home. 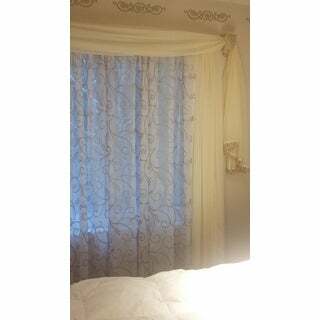 Beautiful sheer curtains. The package contains two panels, each panel measurements are: 37'' wide x 84'' long. I purchhased them in color gray, though what is gray is the leaf swirl embroidered detail. The rest of the fabric is white. Great quality and perfect for layering, because they are sheer panels. They are not meant to cover or block the light in anyway or for privacy purposes. I really like the flow and options on stitching color. They were a great price for the panel set. If you have a wide window I would suggest using two panel sets...so you will have an even flow of four panels to cover the wide window nicely. These panels are sheer as well as I mentioned stitched detail so I would not recommend this item to some pet owners. I paired these with solid grey panels. Looks great. I have been looking for nearly 2 years for the perfect curtains and the perfect shears. I finally found both at Overstock and I've already told all of my friends about Overstock. I received a notice that the curtains are on Backorder, but I've already received the "Amrapur Overseas Leaf Swirl Embroidered Curtain Panel Pair" and they're even more beautiful when you're looking at them as you hold them in your hand than they look on the website. Absolutely beautiful!! I'm a new customer but I will definitely be purchasing from Overstock from now on. I am NOT being paid to write anything I've written. I'm simply always very straightforward and honest. The quality of these shears is wonderful, both in design and in the manufacturing, as well. Buy them while they're still available!! You won't regret your decision to purchase these extremely high-quality Sheers. Have fun shopping and enjoy your purchases! I love the Amrapur Leaf Curtains. The quality of the fabric is exceptional and the level of sheerness is exactly what I was looking for. I am not a fan of heavy curtains in my bedroom because my windows back up to woods and I love some light coming through. I purchased 2 pairs ( 4 panels) to add to some exsisting sheers and I achieved the look I wanted. I especially love the hems that allow you to use the sheers in a variety of rod sizes from slim to wide. The price was great for the quality. I usually don't write reviews, but I loved these so much. 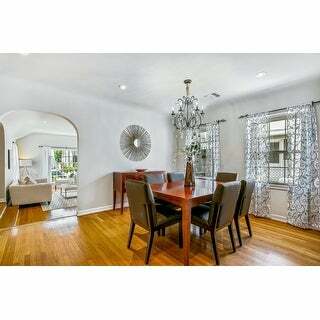 I bought the grey for the family room and the ivory for the living/dining. I had to extend the ivory ones with coordinating fabric because they are only 84 inches long-but they came out great. I love the leave/swirl pattern. Fits well with my decor. Price was great for quality embroidered panels. ELEGANT IVORY LEAF SWIRL STITCHING ON CURTAINS, COMPLIMENTS AMRAUPUR OVERSEAS "SAMANTHA" 8 PIECE COMFORTER SET. I LOVE THEM SO MUCH THAT I REORDERED ANOTHER PAIR TO HANG ON THE GLASS FRENCH DOORS. I RECOMMENDED THEM TO MY COWORKER WHO WAS HAVING TROUBLE FINDING THE RIGHT PANELS FOR HER LIVING ROOM. 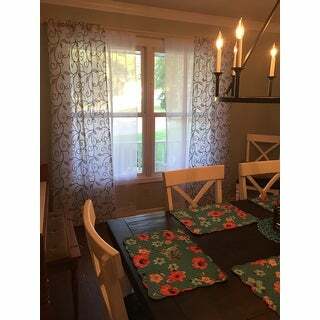 I used these curtains in our dining room and have received compliments about them. They are light and pretty. The embroidered leaf pattern adds a nice look. I added some sheer white panels behind them for a layered look and to add a little more protection from the bright afternoon sun that comes through our windows. I would recommend these curtains. 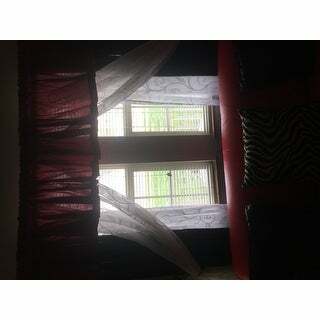 Curtains are pretty and quality looks good. Didn't see any flaws while hanging. 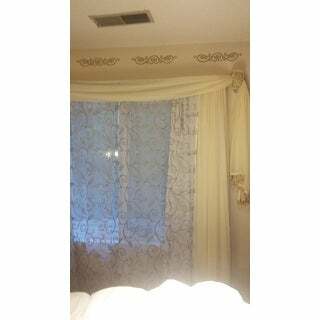 These curtains were lovely. Just like what I imagined. I ordered 2 not realizing they came in a pair, but other than that they are a great value. Delicate and airy. I love these curtains The embroidered swirl is made with thick thread so the swirl is raised and very prominent. The fabric is lightweight and very drapable. They are just what I was looking for. Beautiful sheers. Great transitional pattern with just the right amount of light filtering. Will be purchasing more for other projects. I have an eye for beautiful things! And, these panels are extraordinarily beautiful! I did recommend overstock.com to my friends and family. Thank you ! Very pretty. They filter out just enough light to soften the room. Stitching is good quality and they look very expensive. Nice quality especially for the price. Lets in just enough light without being overwhelming. Brightens up the room with a new look. Considering getting more for another room. Warning: The the patterns on two panels in the package do not line up horizontally. I purchased 3 packages and by switching panels around was able to get the patterns to almost line up on the two windows that were on the same wall. The patterns on the 2 panels for third window does not line up with either each other or the other two windows but it is on a different wall and does not face the door. I like the fabric and the look of these curtains enough that I contemplated buying 3 more to see if I could get more consistency but decided no one would probably notice but me. Life is too short to worry about such things but I wanted to warn others that may care. These were inexpensive and true to the maxim...you get what you pay for. Love these. Prettier in person. They lighten up my room. So happy I decided on these! Very pleased with high quality. Wonderful material and elegant. embroidery is beautiful. These provide privacy because they aren’t too sheer. Also very easy to hang. "Do these gorgeous curtain come longer than 84” - like 95 or 106 ..?" We only carry one size at this time. "Do you have waterfall valances to match these swirl curtain panels"
"Any idea when the grey ones will be in it is the last day of the first week in March when we where told they would be in." This will be back in stock by the middle of the month. "Will the gray design come back in stock?" We expect more in stock around the first week of March. "What is the width of the rod pocket???" "What is the length of this curtain"
"The white appear lovely. They look wider at the bottom. My window is 96 in. Wide. How many do I need?" They're not wider at the bottom. My window's 72 inches and I have 4.